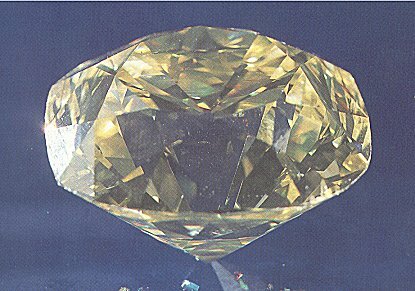 Not long after the formation of De Beers Consolidated Mines Limited in March 1888, a huge light yellow octahedral crystal was found in the De Beers Mine. The gem weighed 428.50 old carats (old carats being the pre-1913 non-metric carat) and measured 47.6 mm through its longest axis and 38.1 mm square. Excluding Victoria, aka the Great White or Jacob, the source of which remains doubtful, the De Beers was the largest diamond found at the four mines at Kimberly during the time period. Weighing 234.65 carats, the De Beers is the seventh largest faceted diamond in the world, not including the Nizam, a now-lost stone which is said to have been only partially cut. It isn't known where the De Beers was cut, but because of its pre-eminence as a cutting center at the time it is very likely that the work was carried out in Amsterdam. After its display in Paris the Maharaja of Patiala bought the De Beers. In 1928 Cartier of Paris set it as the centerpiece of a ceremonial necklace that came to be known as the Patiala Necklace. Sometime during the 1930's the diamond was acquired by its present owners who loaned it in 1973 for an exhibition in Israel. spectacular pieces of jewelry ever created. After the end of the Raj, the art deco Patiala Necklace disappeared. Then in 1998, someone came upon the remnants of it in a second hand jewelry shop in London. All of the big stones were gone: seven stones ranging from 18 to 73 carats, set above a pendant, and the 234.69-carat De Beers Diamond, seventh largest in the world. 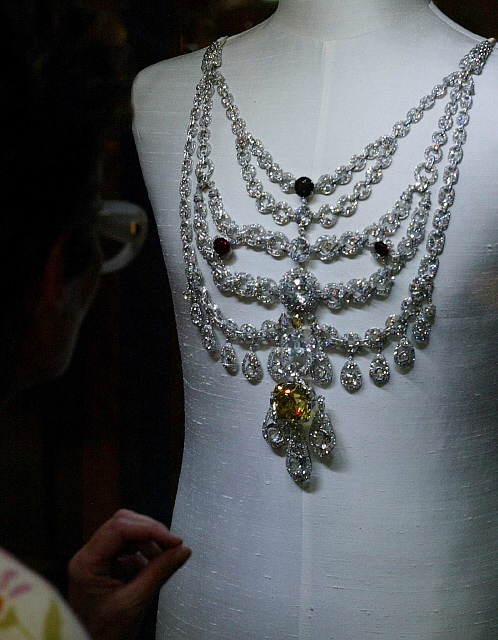 Cartier acquired the remains of the necklace and spent four years restoring it. They tried recreating the original replacing the missing diamonds with a variety of natural stones such as white sapphires or white topazes, but with disappointing results. Back to the diamonds. The original diamonds were of course not available including the De Beers Diamond itself. While the search for replacements continues, Cartier decided to use cubic zirconium to substitute for the seven diamonds and synthetic rubies to substitute for the original Burmese marvels. A replica of the De Beers Diamond was created and set in the necklace, but what type of synthetic material used has not been released to the press. (One source actually said synthetic yellow sapphire, but this would have taken a prohibitively long time to cut and polish due to the immense size of the replica and the fact sapphire is a very tough stone, being a 9 on the Mohs hardness scale. Therefore, it is more than likely tha yellow cubic zirconium was used, and another clue is that in a number of photos of the necklace, the De Beers replica casts off a number of different colors, something a synthetic yellow sapphire wouldn't do to that degree, but which a yellow cubic zirconium would.) The necklace originally contained about 2,930 diamonds weighing about 962.25 carats. On May 6th, 1982, the De Beers came up for auction at Sotheby's in Geneva. It was generally thought that bidding could reach as much as $4.5 million. At the event the stone was bought when the top bid of $3.16 million remained below its undisclosed reserve. In his book Precious Stones and Gems, Edwin Streeter has unwittingly been the cause of some confusion concering this diamond. 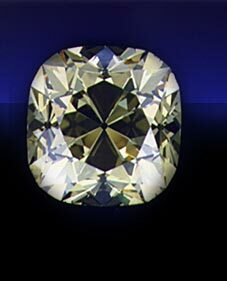 He wrote that it was shown at the Paris Exhibition as the "Victoria"; this has led to the listing in some publications of a diamond called the Victoria I, weighing 228.50 old carats, also found in 1888 and also a light yellow color, and afterwords sold to an Indian prince. A mathmatical calculation will show that this is the same stone as the De Beers and not to be confused with the diamond known variously as the Imperial, Great White or Jacob, a diamond which was cut into a cushion shape of 184.50 carats. Sources: Diamonds - Famous, Notable and Unique by GIA, Famous Diamonds by Ian Balfour, the Cartier website, and numerous articles on the internet.